The Illuminated River project was developed through a collaboration between the Rothschild Foundation, the Mayor of London and a large number of stakeholders along the Thames. Once complete, this will be the longest permanent public art commission in the world at 2.5 miles in length. 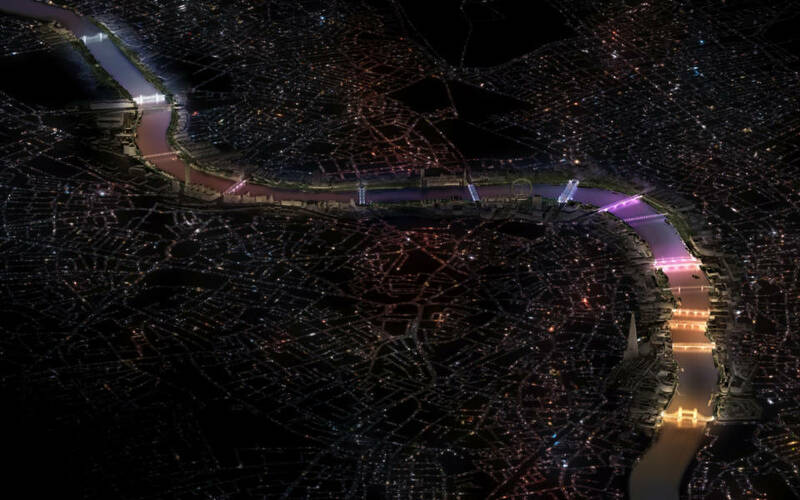 The Illuminated River will be a design commission on an unprecedented scale: a scheme to light central London’s bridges along the River Thames. The project is being managed by a new charity, the Illuminated River Foundation. The Rothschild Foundation funded feasibility and start-up costs as well as awarding a grant of £5 million to the Illuminated River Foundation to help realise the project. An international design competition was held in 2016 to find the best creative responses for lighting Central London’s bridges. The winning submission, by US artist Leo Villareal and British architects, Lifschutz Davidson Sandilands (LDS), will be a kinetic lighting artwork that will unify and illuminate the bridges for 20 years. US artist Leo Villareal is known for his pioneering LED light sculptures and for creating The Bay Lights project for the Bay Bridge in San Francisco (which has become a permanent installation). LDS are the architects of the Golden Jubilee Footbridges in London, and have worked extensively in public realm projects along the Thames. The project will encompass all the bridges from Albert to Tower Bridge but will be phased so that installations on the groups of bridges will be grouped from 2019 to 2022. The Illuminated River Foundation, LDS Architects and Leo Villareal are engaged in deep consultation and discussion with many different stakeholders and communities along the river and beyond in order to realise this exciting project. It will be the longest permanent public art commission in the world at 2.5 miles in length.